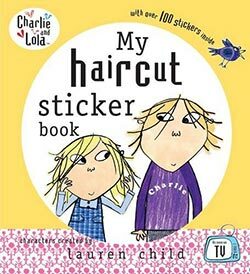 Charlie and Lola are due to get their hair cut but Lola is determined that hers is fine just the way it is. The fact that she can’t see properly or play or do her ballet doesn’t seem to worry her and Charlie can’t understand why she won’t get her hair cut. Eventually he works out it’s because her hair is so tangled and knotty and she hates having it combed. So Charlie, in his loving and caring big brother way, manages to coax out the tangles and Lola emerges looking like a princess.